Choose a weightlifting bar, a pair of collars and the plate models that you like. Chose and train! 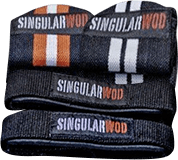 The Singular WOD weightlifting package is perfect for continuing your workouts at home. You can configure it to your liking and to include exactly plates and weights you want. - Weightlifting Bar: Choose between a 15-kg and 20-kg bar. - 20-kg plates: 2 units. Choose between black, colour, plus, elite and Olympic Training plates. - 2.5-kg plates: 2 units. Choose between black, colour or Olympic Fractional Training plates. Maximum hold for your plates. Our most robust workout collar. Manufactured with metal core and locking mechanism. No bar is smarter than they are. Bar for weightlifting that is ideal for junior lifters or to practice technique. The first step in Olympic lifting. Maximum hold for your plates. Minimum weight on the bar. With a quick lock mechanism. High-end training locks for weightlifting.